With its very pure water, the Dour is an ideal place to start a brewery! There is no doubt that brewing will have taken place in Dover from the earleist times, with Monastery estates producing beer for their monks and the ordinary man drinking small beer - very low alcohol beer as a safe alternative to river water, which could become very polluted in developing towns. We know that the Maison Dieu was used as a victuallers for the Navy in 1590 and the malt mill constructed to supply it shows that brewing would have taken place to supply the King's men. 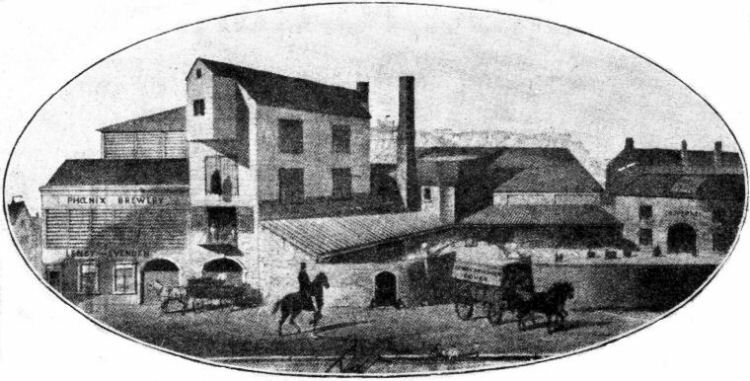 In 1740 the Phoenix Brewery was founded near Dolphin Passage, and in 1829 Favius Kingsford founded a brewery that was to become known as the Windmill Brewery. The site is now occupied by the Kingsford Court flats at the junction of Coombe Valley Road, then Union Road, and London Road. Other Breweries recorded include Cliffe's Brewery at Bulwark Hill (1870), Elvey's, who later manufactured soft drinks, at Snargate Street, and Satchells in Limekiln Street, demolished in 1900. 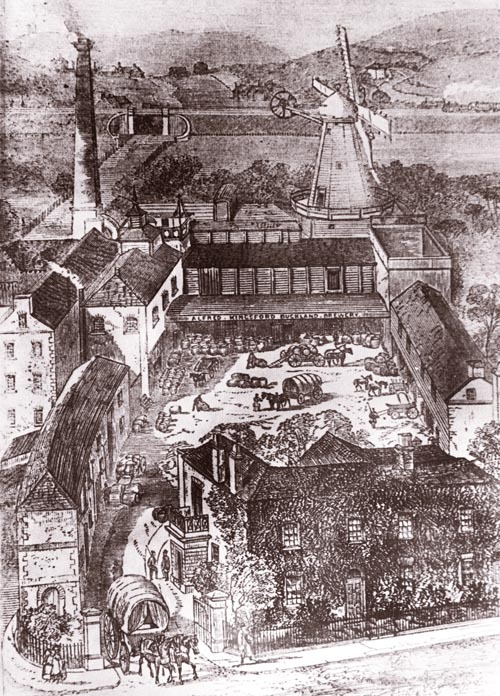 Grant's Distillery in Limekiln Street produced gin, cherry brandy and Standfast whiskey. Although he owned the site from 1829, the Windmill that made Kingsford's brewery such a landmark was not built until 1798. Favius Kingsford was an experienced miller and used windpower to draw water for brewing up from wells within his premises. His son Alfred took over the business and is recorded in 1862 to have imported 2,302,169 quarters of foreign barley, and 8,442 tons of hops through the port of Dover to supply his brewery. Given the quantities of raw materials, the mill was likely to have been used to winch stores up to the top of the building. The business must have been very profitable as Kingsford built "Woodside" a fine mansion at the bottom of Whitfield Hill, later owned by Dover Mayor William Crundall, and made generous contributions to the cost of erecting the old Salem Baptist Church, which stood where Boots the Chemists is now located. Dating back to at least 1840, Alfred Leney bought the Phoenix Brewery near Dolphin Lane from the estate of James and Thomas Walker. Since he was just 23 years old, it is thought that he may have had financial help from his uncle, James Evenden, as his name was incorporated in the name of the business for six years until 1865, when Leney gained sole ownership. Alfred Leney married into the Fremlin's family of brewers and was joined in the business by his sons Charles, Hugh and Frank, who all gained vital experience of their trade at other breweries. 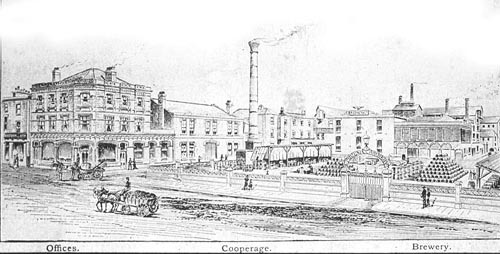 In 1900 'Dover Illustrated' included an article on Leney's in which the brewery's extension to cover five acres in the St James' area of the town was described. The periodical praises its modern steam engines and suggests that the brewery will "soon be one of the largest in Kent" with "the best modern systems of Brewing". Leney's produced a number of ales, many of which were bottled, enabling national distribution. 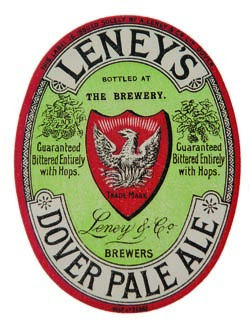 Leney's Pale Ale was very highly regarded and their Nourishing Stout was praised for its medicinal qualities in "The Lancet". Leney's had over 100 tied houses in 1900, and had depots in London and Hastings. The brewery was an important employer in the town and when Alfred died in 1900 over 1000 people attended the funeral. After Alfred Leney's death the directorship of Leney's passed to his son Walter. In 1923 the Phoenix Brewery was taken over by Fremlin's, with Alfred Leney Junior as its chairman. A beer bottling plant remained in operation and business also continued as Leney's Table Waters Ltd. until 1950. Alfred died in 1953, aged 93. Bottling ceased at Dover. The St James' Street Yard became purely a distributon centre and in 1963 Fremlin's moved that operation to Maxton on the outskirts of Dover. The former brewery site was put up for sale. Surviving former brewery buildings include the former offices on the corner of Castle Street and Dolphin Lane and one of the four Dover malthouses. The former ABC cinema on Castle Street, now demolished, was built on the site, as was the Bus Depot, now itself demolished. The rest of the area in which war damaged buildings were pulled down remained undeveloped as a number of proposed St James area regeneration schemes fell through. Now, however, significant investment means that a devlopment plan to include shops and leisure facilities is soon to be built. During its heyday, Leney's had taken over Kingsfords, and smaller brewers failed in the face of more this more efficient competition. It would seem that the days of commercial brewing in Dover were over but, in 2012, Tír Dhá Ghlas Brewery at Cullin’s Yard opened as a micro-brewery and Ripple Steam Brewery opened in Sutton near Deal. A number of other micro-breweries now operate in Dover and have good local support.